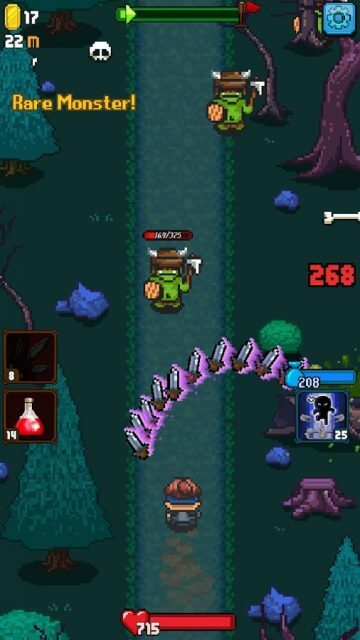 Combining endless running with role-playing game elements, Dash Quest brings the best of both worlds to your Android device. The game has everything that every seasoned RPG lover wants – Gear, spells, pets, skills and what not! There’s also a prestige system and several challenging game modes to keep you busy for hours. Dash Quest’s fast-paced gameplay is perfect for the impatient gamer, which is why it’s so popular among casual players. If you have just started playing, then our tips and hints will help you last longer and use the right skills and items to progress smoothly throughout the game. Play the main game mode and try to find the Hit Point and Mana Point recipes. These recipes improve potions, which in turn will help you restore your HP and MP much more effectively. And while you are searching for recipes, don’t forget to search the ancient Grimoire. Using this item, you will be able to level-up your spells. There are several more key items to find, and they will help your character become stronger, making it somewhat easy for you to complete other game modes. Tapping and holding the screen lets you charge a special attack, which can deal more damage than a normal attack. You can charge your special attack for a few seconds, but the end result would be a small orb which will deal less damage. Tap and hold the screen until the force field surrounding your character grows big and then lift your finger up to release the charged special attack. Of course you can’t charge a bigger special attack every time as enemies will keep coming, try to charge it when the road is clear and then release it when you spot an enemy. Don’t forget to equip items that boost your character’s stats. One such stat is the “Airstream”. If you find an item that improves this stat, you should use it immediately. Once equipped, your character’s movement speed will increase and you will notice an aura in front of him. With an improved airstream you can bump into heroes while moving faster and stun them for a few seconds. It will take some time to for them to counterattack, and this will give you enough opportunity to attack them. However, this won’t be effective against stronger foes, especially those that attack from a distance or use powerful spells. They can attack you even before you get close to them. On leveling-up, you will get skill points, which is used to unlock/upgrade your skills. There are several skills that can be upgraded using points, but try to level-up the Shield Training. Upgrading the first skill will let you block attacks quicker than normal. It can be very effective against bosses, as you will be able to time your blocks better with an upgraded Shield Training skill. There are several other skills, which you can unlock and upgrade. For starters try to upgrade this skill along with treasure hunter skill as it will increase the chances of finding a rare item.